Mary’s new book is in all good bookshops now! Qantas Media Award-winning columnist Mary Holm writes a Q&A personal finance column in the Weekend Herald, is interviewed on money issues every second Thursday on National Radio, and presents highly praised seminars (see Seminars page). She is a director of the Financial Markets Authority and of Financial Services Complaints Ltd (FSCL), and frequently discusses personal finance in the media. Mary is the author of six books, four of which have been on the NZ bestseller list. The most recent is “Rich Enough? A Laid-Back Guide For Every Kiwi” (published by HarperCollins in 2018). The others are “Get Rich Slow” and “Investing Made Simple” (both published by Penguin), and three books about KiwiSaver (published by Random House but now out of print). She has also written three booklets for the Reserve Bank, the most recent being “Upside, Downside – a guide to risk for savers and investors”. She holds a BA in economic history (Victoria University of Wellington), MA in journalism (University of Michigan) and MBA in finance (University of Chicago, where she was taught by Nobel Laureate Merton Miller and graduated in the top 15%). Earlier work includes: Director of the Banking Ombudsman Scheme for six years ending January 2016; part-time senior lecturer in Financial Literacy at the University of Auckland for five years ending 2013; and syndicated columnist in the Dominion Post, Christchurch Press, Waikato Times and Gisborne Herald for 16 years ending 2013. She has also been a member of: the evaluation panel for KiwiSaver default providers in 2014, the External Advisory Group for Treasury’s Long-Term Fiscal Statement in 2013, the Savings Working Group in 2010–11, and the Capital Market Development Taskforce in 2009. She also helped to develop the KiwiSaver Fund Finder on sorted.org.nz. She has been business editor of the Auckland Sun and Auckland Star, and has covered personal finance for the NZ Listener, Australian Financial Review and Chicago Tribune. She enjoys movies and plays, walking in wild places, swimming, and meeting with friends. The opinions Mary expresses in her writing and on this website are in no way connected with the Financial Markets Authority or Financial Services Complaints Ltd. I must say that I am an avid listener to your podcasts on RNZ. It’s one thing I look forward to on every 2nd Thursday. I’d like to say I am a huge fan of your work and have been to a seminar recently in Wellington which was just excellent. I’m pretty sure I was the youngest in the room. I listen to all the money talk I can — of yours! Not particularly interested otherwise. The first thing I do on a Saturday morning is read your column….Recently my employer’s superannuation fund paid out (it was a huge fund) and they provided free professional independent financial advice for the beneficiaries such as myself. Before I met with the financial advisor I said to my wife — “I’m not going to be able to get through this meeting without saying at least once ‘But Mary Holm says…’ By the end of the session with the advisor even he was saying “Mary says…”!! Your advice is deeply appreciated and has helped us in unexpected ways in uncertain times. Your advice is garnished with kindness and thoughtfulness. I enjoyed your answer in today’s Shares vs Property question. As a uni student … I have referenced some of your books for personal finance assignments too, so I just wanted to let you know I always enjoy reading your insights. I’ve lost count of the number of currency swings, economic downtowns, property slumps (and booms), even global financial meltdowns I’ve navigated thanks to your advice. Thanks for your continuing excellent work educating investors. I love your column. I have had your column linked as my homepage for at least 2 years. Thanks Mary, for being part of my weekend. Saturday morning for me entails making a giant cup of plungered coffee and parking up at the kitchen table, pouring over the Saturday Herald. Your column is always a favourite. Thanks to you I have now, at the age of 50, joined KiwiSaver… I have learned lots over the past 7 months, thank you for being part of my learning financial journey. Your column, interviews and support of KiwiSaver are terrific. I would never have saved a cent if not for KiwiSaver. My wife and I have followed and enjoyed your writings for many years, including over the past decade that we’ve been overseas (Seattle), by following your weekly column in the Herald. I often listen to your RNZ slots, have read some of your books, and have learned a lot from you. As a member of the generation rent cohort I would like to thank you for making me feel a wee bit better knowing that there are other ways to invest money other than property! …Following your advice on RNZ, we have paid down all our debts, saved up our rainy day money ($15,000), and got some savings too now ($20,000). To Jesse Mulligan: Your money chats with Mary Holm are simply fantastic. I am thinking of starting a religion in Mary’s honour and building statues and singing songs about her. I LOVE your work — inspiring, straightforward and non-judgemental. Long time fan who has never been in contact before. …Reading your Herald column got me into KiwiSaver — and then I got my teenage children signed up. After years of them giving me a hard time about it, they now realise the benefit. So thank you. By the way — absolutely love your column. Have done for years. Read it every week. I love how you express your opinion yet are not opinionated. And how you are firm and sure yet with a light touch and without arrogance. Thank you very much for what you do. My wife and I read your column every week and we very much appreciate the advice (as well as your sense of humour!). 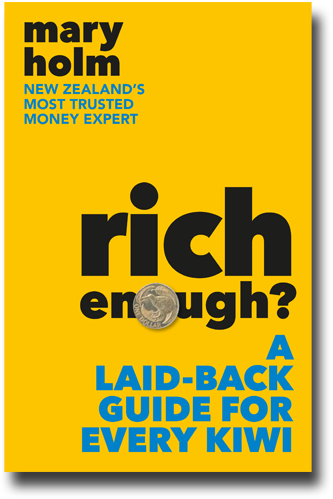 I have done very well out of KiwiSaver (doubled what I put in) and a part of that has been from reading your many columns over the years, which have had great information about the good, the bad and the ugly of KiwiSaver and finances in general. All in all, I feel as though mine and my son’s future is set and secured thanks to KiwiSaver and your fantastic advice.